In the spring of 2007, musician and producer Paul ‘Mudd’ Murphy decided to launch his own label. Named after the house he grew up in, Claremont 56 would release beautiful music by friends, associates, collaborators and like-minded musicians. In the 10 years that have passed since, Claremont 56 has more than surpassed Murphy’s modest expectations. It has built up a cult following around the world, with listeners responding positively to the label’s combination of magical music, beautiful artwork, and impeccable packaging. 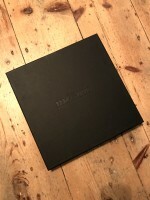 To mark the label’s first decade, Murphy has put together a sumptuous vinyl box set of previously unheard material, produced and presented with the same attention to detail that listeners have come to expect. Each copy of Claremont 56: 10 Years contains five weighty slabs of wax and a bespoke info sheet, housed in a specially designed, hand-numbered box with debossed logos on the front and rear. However impressive the packaging, it’s the music that makes Claremont 56: 10 Years stand out. Featuring a mixture of unreleased tracks and brand new remixes of vintage label releases, the highlights come thick and fast. As you’d expect, some of the most impressive contributions come from those artists you could describe as “legendary”, including Chicago deep house originators Larry Heard and Ron Trent. Can legend Holger Czukay kindly contributes one of the standout moments, the eccentric ‘Music To Be Murdered By’, from his own unreleased catalogue, while Afro-cosmic pioneer Daniele Baldelli joins forces with Marco Dionigi to deliver a typically spacey remix of Bison’s ‘Familiar Stranger’. There’s also an epic, Afro-tinged dub disco remix of Smith & Mudd’s ‘Nether’ by Norwegian scene founder Bjorn Torske. Elsewhere, Good Timin’ man Jex Opolis turns an overlooked track by Paraiso into a samba-boogie killer, Sean P dubs out Zee Erf’s beautiful cover of ‘Southern Freeez’, and Phil Mison turns FreshRo’s laidback electrofunk cut ‘Pacific State’ into a breezy, Balearic gem. Look out too, for the emotion-rich beauty of Statues’ ‘River Darkness’ – a track arguably worth the cost of the box set on its own – and the deep space explorations of Almunia’s Leo Ceccanti. We could go on, but we’re running out of space. Suffice to say, Claremont 56: 10 Years is a lovingly compiled, curated and presented celebration of the label’s first decade.